Debut Album Full Blast Fuckery Available on Vinyl Now! Detroit, Michigan's WILSON have been riding the wave that is #Fuckery since the release of their debut album last year. Known for their extremely funny and over the top videos, WILSON is proud to bring to you another cinematic masterpiece. The video for the song "If You Ever Leave Me, I Will Find You" was directed by Tradesmen Films LLC. Check out the video HERE. The band's debut album Full Blast Fuckery is available now for the first time on vinyl! This special edition is lime green, features all new artwork and comes with an exclusive 18" x 24" poster. The band will be performing at a special vinyl record release show in Detroit, MI on June 28th. 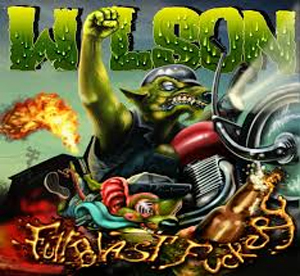 WILSON will bring the #Fuckery to the nation this summer with HE IS LEGEND and MAYLENE and the SONS OF DISASTER. The tour begins July 25th in Atlanta, GA and runs through August 24th in Winston-Salem, NC. WILSON will also be supporting Rob Zombie on a show this summer, MOTORHEAD's Motorboat Cruise and recently announced they will appear at the Louder Than Life Festival in Louisville, KY this October. Pick up your copy in a special bundle package and grab some WILSON merch at http://wilsonparties.bigcartel.com/.